It’s about that time of year again — tax season. That means spending copious amounts of time collecting forms, stubs, and receipts to appease the good ol’ taxman. To simplify things, I used to go to H&R Block. What I didn’t realize is that H&R Block provides little service over and above what you can do yourself with proper tax software. It made sense at the time — as a student their $29.99 rate is fairly reasonable. However, out of school their rate jumps to $59.99+ making it worthwhile to do it yourself. The second thing I didn’t realize is how easy it is to do your own taxes. Even those with “more complicated” tax situations should find it quite easy with a program like Studio Tax. Studio Tax is 100% free (no catches) for up to 20 returns, so unless you are the Duggar family, you shouldn’t come close to hitting the limit. Studio Tax is the best free tax software in Canada that I was able to find. It is surprisingly robust and helps walk you through the tax-filing process; even asking you questions about yourself like a tax professional would. Based on your responses to those questions, it will automatically serve up the necessary tax forms. You can then choose additional forms that are applicable to you. The forms are easy to follow — as easy as “painting by the numbers”. The best part about Studio Tax, however, is the easy way in which it makes the final file available for net filing. Once you have filled out your forms, Studio Tax will create a TAX file that can easily be uploaded directly to the CRA via Netfile. I am a huge fan of this approach because it means you deal with no paper (other than what you have received). The only room for improvement for Studio Tax is the interface (see below), which is frankly atrocious. 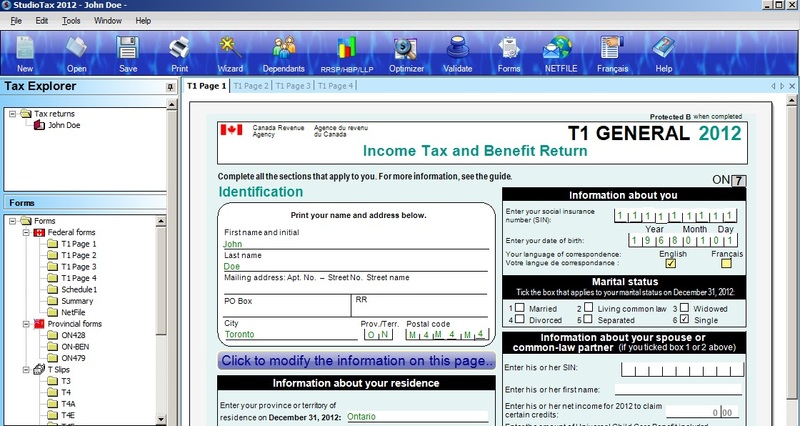 Doing your taxes is not supposed to be a fun experience, but an interface uplift is desperately needed nonetheless. Thankfully, its ease of use more than makes up for its poor interface.